Gojiberries tastes mildly sweet with a super mild sourness, you can replace the raisins or dates in smoothies with this incredible berries. 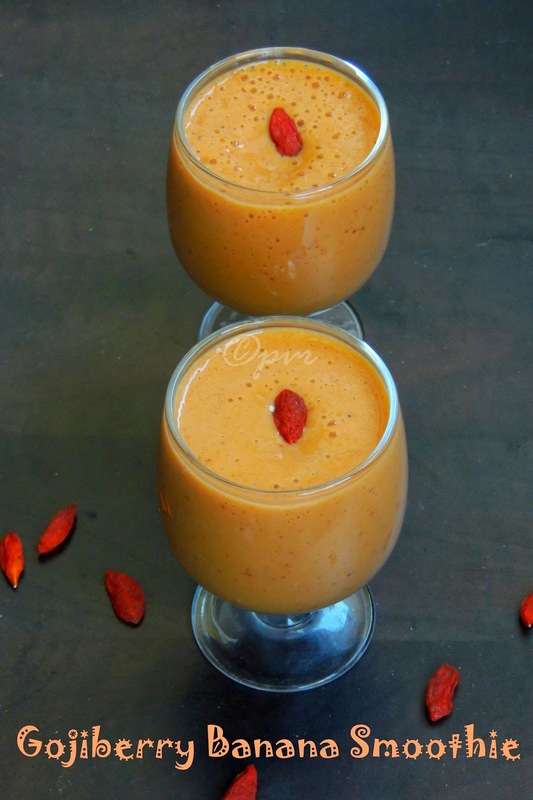 I prepared this smoothie without sugar, goji berries and banana works wonder here and some honey gives enough sweetness to this healthy,super filling smoothie. 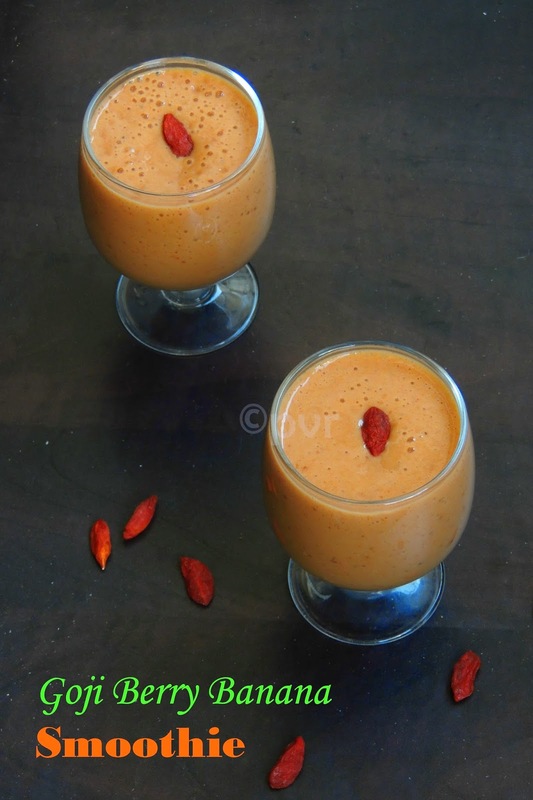 Personally i felt adding gojiberries often in smoothies, as it a best way to sneak this healthy berries.Am running my first week of blogging marathon withSizzling smoothies as theme, obviously stay tuned to check with my two more smoothies i'll be posting for the next two days. Check out the Blogging Marathon page for the other Blogging Marathoners doing BM#43. Take the gojiberries, banana and honey in a blender, blend everything as smooth paste. Now add the chilled milk and blend everything as thick smoothie. Looks so incredibly sinful Priya..never tried Gojiberries myself ..will have to read up on them..very lovely start for the BM..
this fruit is new for me, delicious smoothie!!! It looks creamy and colorful. the smoothie must have been yummy. Very healthy and delicious Gojiberry shake........wish i cud get some over here!! Never tried goji berries. . Any new fruit I just start as a smoothie. Lovely creamy smoothie. Never heard of the berries, will look them up. I have seen gojiberry in health shops but not yet tried it. Smoothie looks so colorful. Havent heard abt this fruit. But love the colour of those berries and also the drink. Lovely color! I use dry gojiberries but haven't found fresh ones here. Beautiful vibrant colored smoothie. I saw and ate these while in UK..but these aren't available here. Wow that look so creamy and beautiful color. this berries are new to me interesting..